Jordan (front of picture) is an eleven-year-old boy living in one of Kigali’s many slums. Hidden down a long, cramped alley, his small house is also home to his mother and three sisters. Like many Rwandan families, Jordan’s is faced with the constant challenges of poverty, disease, lack of education, and HIV/AIDS. Three years ago, Jordan’s father died of HIV/AIDS, but not before passing it to his mother who gave it to Jordan during pregnancy. Since his family cannot afford food, medicine for HIV/AIDS, and education at the same time, two of his older sisters had to drop out of school, and the third may not be able to return next year. Although still in school, Jordan is often sick due to HIV/AIDS and missed so much school last year that he must repeat his third year of elementary education. The Yego Foundation has identified Jordan as an orphaned and vulnerable child (OVC), and has approached his family to offer basic counselling services through listening, care, love, encouragement, and coaching. Unfortunately, YEGO currently lacks the funds to begin providing other services. 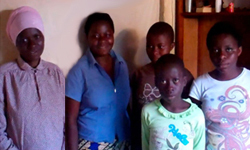 As funds become available, YEGO hopes to provide money to enable Jordan and his sisters to continue their education and assist the family in meeting its basic needs. To help Jordan and other children like him, please consider helping YEGO Rwanda today.